The Financial Transparency Act, proposed in Congress in May 2015, could transform the business and practice of financial regulatory compliance. The Act requires all eight U.S. financial regulatory agencies to adopt common data fields and formats for the information they collect. Common data standards will allow commercial software tools to automatically produce the reports that must be compiled, filed, and submitted by entities regulated by these agencies. For public companies, banks, financial firms, and derivatives users, the Financial Transparency Act offers the promise of cheaper, automated compliance – if it is passed by Congress and implemented by the eight agencies. Learn the history of data standards in U.S. federal financial regulation, including the initial adoption of XML formats for reports to the Securities and Exchange Commission and Federal Deposit Insurance Corporation, the founding of the Treasury Department’s Office of Financial Research, and the adoption of the government-wide Legal Entity Identifier. Discuss the challenges facing data standardization in U.S. federal financial regulation, including high-profile failures at the Securities and Exchange Commission. 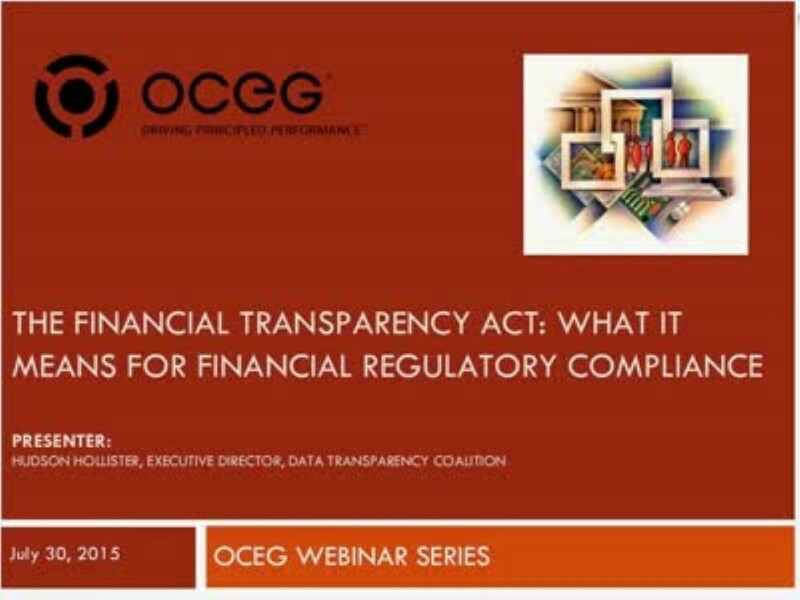 Learn the legislative history behind the Financial Transparency Act, including negotiation during Congress’ consideration of the Dodd-Frank Act and increasing support for a legislative mandate for data standards in U.S. federal financial regulation. Explore the potential of sector-wide data standards to improve U.S. federal financial regulatory compliance. Know how to engage with Congress and financial regulatory agencies to support the transformation from disconnected document-based reporting to standardized and open data-centric reporting. We have emailed instructions to access The Financial Transparency Act What it Means for Financial Regulatory Compliance to . Make sure the email arrives in your inbox: either add "support@oceg.org" as a safe sender to your email platform, or if you use Gmail, drag our email into your Primary tab.